Perfect pick me up boost when your immune system is running a little low or you are experiencing low energy, adrenal fatigue or long periods of stress. Herbs: Echinacea*, Licorice*, Lime flowers, Tulsi*, Reishi, Siberian ginseng*, Withania* Greens: Alfalfa*, Barley grass*, Spirulina* Fruit: Acai berries*, Pineapple, Lemon, Lime. Echinacea, reishi, withania, lime flowers and siberian ginseng all help tone, nourish, strengthen and balance the immune system. While the sweet delicious flavours of licorice and tulsi combined help with replenishing the body when it is under constant stress. Licorice also assists in reducing the severity of coughs due to it's soothing mucilage properties and action on the mucous membranes. Alfalfa, barley grass and spirulina are alkalising, full of vitamins, minerals and enzymes. 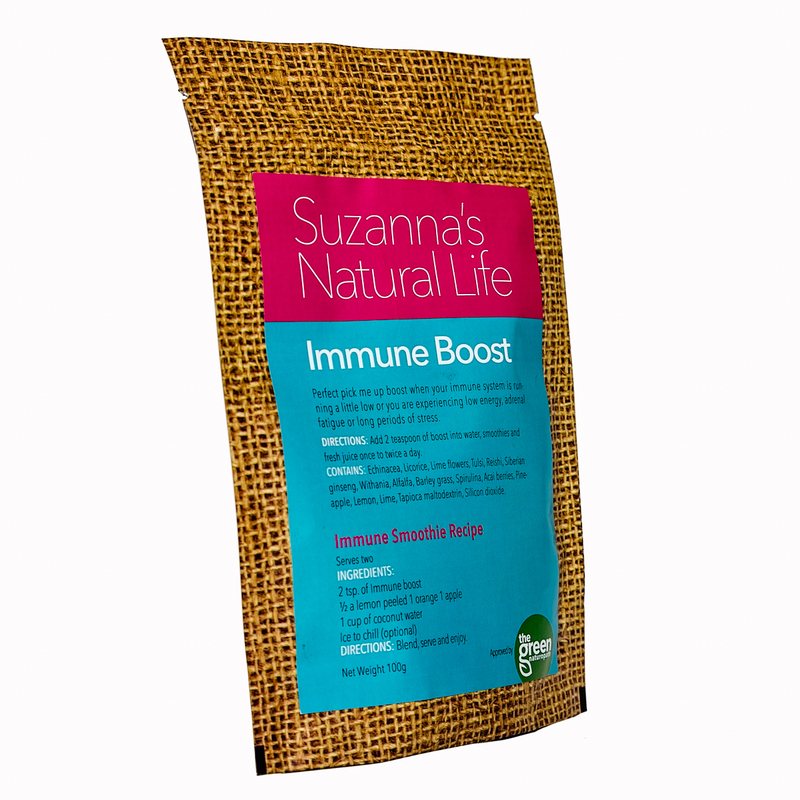 Immune boosts alkalising combination help stimulate killer cells to help fight common viruses, colds and flu. Pineapple, acai berries, lemon and lime combined are a powerful Vitamin C hit to help strengthen the immune system, stimulate white blood cell growth and act as an antioxidant to defend against free radical damage. The potent combination of lemon and lime help dissolve mucous and also acts as an antiseptic which may assist with reducing any irritating feeling in the mouth and throat.